REFERENCE: Krause, D. E., “Gray Iron-A Unique Engineering Material” Gray, Ductile, and Malleable Iron Castings-Current Capabilities, ASTM STP 455, American Society for Testing and Materials, Philadelphia, 1969, pp. 3-28. ABSTRACT: Gray iron is the most versatile of all foundry metals. The high carbon content is responsible for ease of melting and casting in the foundry and for ease of machining in subsequent manufacturing. The low degree or absence of shrinkage and high fluidity provide maximum freedom of design for the engineer. By suitable adjustment in composition and selection of casting method, tensile strength can be varied from less than 20,000 psi to over 60,000 psi and hardness from 100 to 300 BHN in the as-cast condition. By subsequent heat treatment, the hardness can be increased to H g should be carefully reviewed before specifying a higher strength and hardness grade of iron. An unnecessary increase in strength and hardness may increase the cost of the casting as well as increase the cost of machining through lower machining rates. 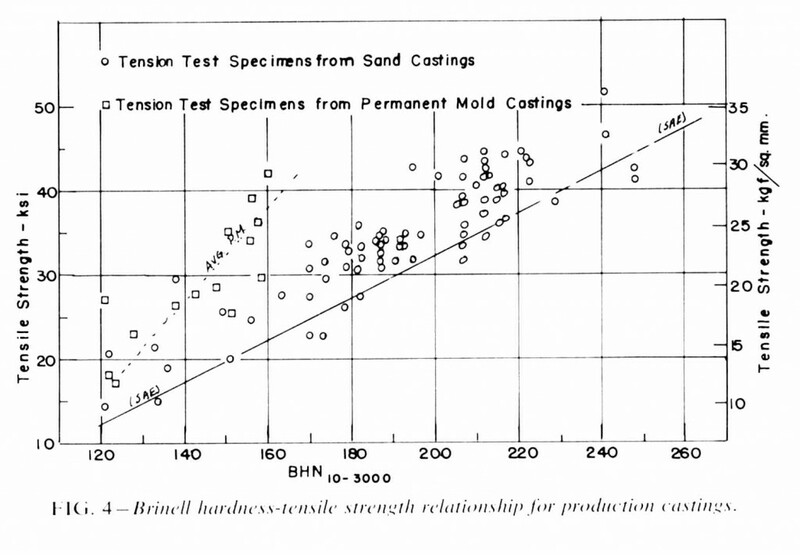 Although the relationship between Brinell hardness and tensile strength for gray iron is not constant, data are shown which will allow use of the Brinell hardness test to estimate the minimum tensile strength of the iron in a casting. While this brief technical paper, originally presented in 1969, is still one of the best summaries of gray iron metallurgy and properties, we call your attention to one item on which recent research and foundry experience has shed more light. This is the matter of manganese and sulfur effects. In contrast to the traditional view of these elemental effects noted herein, work in the 1980’s confirms that in many cases manganese levels beyond that amount combined with sulfur (about 1.7 times the sulfur level) tend to reduce strength and hardness via promotion of more ferrite. However, low levels too close to this 1.7 “balanced ratio” tend to promote high and more erratic hardness and/or carbides. Consequently, for most applications the optimum operating level for manganese appears to be about (1.7 x % Sulfur), + 0.3% to 0.5%. For example, for an iron with 0.10% Sulfur, the optimum range for Manganese would be 0.47% to 0.67%. Running toward the low end of the range would normally maintain higher hardness and tensile strength while running toward the high end would decrease both. This effect is also influenced by other metallurgical conditions peculiar to each base iron so that the optimum range needs to be determined for each particular melting operation. We hope this clarification will be informative and useful to both casting producers and users. Gray iron is one of the oldest cast ferrous materials. In spite of competition from newer materials and their energetic promotion, gray iron is still used for those applications where its properties have proved it to be the most suitable material available. Next to wrought steel, gray iron is the most widely used metallic material for engineering purposes. For 1967, production of gray iron castings was over 14 million tons, or about two and one-half times the volume of all other types of castings combined. There are several reasons for its popularity and widespread use. It has a number of desirable characteristics not possessed by any other metal and yet is among the cheapest of ferrous materials available to the engineer. Gray iron castings are readily available in nearly all industrial areas and can be produced in foundries representing comparatively modest investments. It is the purpose of this paper to bring to your attention the characteristics of gray iron which make the material so useful. Gray iron is one of the most easily cast of all metals in the foundry. It has the lowest pouring temperature of the ferrous metals, which is reflected in its high fluidity and its ability to be cast into intricate shapes. As a result of a peculiarity during final stages of solidification, it has very low and, in some cases, no liquid to solid shrinkage so that sound castings are readily obtainable. For the majority of applications, gray iron is used in its as-cast condition, thus simplifying production. Gray iron has excellent machining qualities producing easily disposed of chips and yielding a surface with excellent wear characteristics. The resistance of gray iron to scoring and galling with proper matrix and graphite structure is universally recognized. Gray iron castings can be produced by virtually any well-known foundry process. Surprisingly enough, in spite of gray iron being an old material and widely used in engineering construction, the metallurgy of the material has not been clearly understood until comparatively recent times. The mechanical properties of gray iron are not only determined by composition but also greatly influenced by foundry practice, particularly cooling rate in the casting. All of the carbon in gray iron, other than that combined with iron to form pearlite in the matrix, is present as graphite in the form of flakes of varying size and shape. It is the presence of these flakes formed on solidification which characterize gray iron. The presence of these flakes also imparts most of the desirable properties to gray iron. MacKenzie in his 1944 Howe Memorial Lecture referred to cast iron as “steel plus graphite.” Although this simple definition still applies, the properties of gray iron are affected by the amount of graphite present as well as the shape, size, and distribution of the graphite flakes. Although the matrix resembles steel, the silicon content is generally higher than for cast steels, and the higher silicon content together with cooling rate influences the amount of carbon in the matrix. Gray iron belongs to a family of high-carbon silicon alloys which include malleable and nodular irons. With the exception of magnesium or other nodularizing elements in nodular iron, it is possible through variations in melting and foundry practice to produce all three materials from the same composition. In spite of the widespread use of gray iron, the metallurgy of it is not clearly understood by many users and even producers of the material. One of the first and most complete discussions of the mechanism of solidification of cast irons was presented in 1946 by Boyles. Detailed discussions of the metallurgy of gray iron may be found in readily available handbooks[3-7]. The most recent review of cast iron metallurgy and the formation of graphite is one by Wieser et al. To avoid unnecessary duplication of information, only the more essential features of the metallurgy of gray iron will be discussed here. Gray iron is commercially produced over a wide range of compositions. Foundries meeting the same specifications may use different compositions to take advantage of lower cost raw materials locally available and the general nature of the type of castings produced in the foundry. For these reasons, inclusion of chemical composition in purchase specifications for castings should be avoided unless essential to the application. The range of compositions which one may find in gray iron castings is as follows: total carbon, 2.75 to 4.00 percent; silicon, 0.75 to 3.00 percent; manganese, 0.25 to 1.50 percent; sulfur, 0.02 to 0.20 percent; phosphorus, 0.02 to 0.75 percent. One or more of the following alloying elements may be present in varying amounts: molybdenum, copper, nickel, vanadium, titanium, tin, antimony, and chromium. Nitrogen is generally present in the range of 20 to 92 ppm. The concentration of some elements may exceed the limits shown above, but generally the ranges are less than shown. Carbon is by far the most important element in gray iron. With the exception of the carbon in the pearlite of the matrix, the carbon is present as graphite. The graphite is present in flake form and as such greatly reduces the tensile strength of the matrix. It is possible to produce all grades of iron of ASTM Specification for Gray Iron Castings (A 48-64) by merely adjusting the carbon and silicon content of the iron. It would be impossible to produce gray iron without an appropriate amount of silicon being present. The addition of silicon reduces the solubility of carbon in iron and also decreases the carbon content of the eutectic. The eutectic of iron and carbon is about 4.3 percent. The addition of each 1.00 percent silicon reduces the amount of carbon in the eutectic by 0.33 percent. Since carbon and silicon are the two principal elements in gray iron, the combined effect of these elements in the form of percent carbon plus 1/s percent silicon is termed carbon equivalent (CE). Gray irons having a carbon equivalent value of less than 4.3 percent are designated hypoeutectic irons, and those with more than 4.3 percent carbon equivalent are called hypereutectic irons. For hypoeutectic irons in the automotive and allied industries, each 0.10 percent increase in carbon equivalent value decreases the tensile strength by about 2700 psi. If the cooling or solidification rate is too great for the carbon equivalent value selected. the iron may freeze in the iron-iron carbide metastable system rather than the stable iron-graphite system, which results in hard or chilled edges on castings. The carbon equivalent value may be varied by changing either or both the carbon and silicon content. Increasing the silicon content has a greater effect on reduction of hard edges than increasing the carbon content to the same carbon equivalent value. Silicon has other effects than changing the carbon content of the eutectic. Increasing the silicon content decreases the carbon content of the pearlite and raises the transformation temperature of ferrite plus pearlite to austenite. This influence of silicon on the critical ranges has been discussed by Rehder. The most common range for manganese in gray iron is from 0.55 to 0.75 percent. Increasing the manganese content tends to promote the formation of pearlite while cooling through the critical range. It is necessary to recognize that only that portion of the manganese not combined with sulfur is effective. Virtually, all of the sulfur in gray iron is present as manganese sulfide, and the manganese necessary for this purpose is 1.7 times the sulfur content. Manganese is often raised beyond 1.00 percent, but in some types of green sand castings pinholes may be encountered. Sulfur is seldom intentionally added to gray iron and usually comes from the coke in the cupola melting process. Up to 0.15 percent, sulfur tends to promote the formation of Type A graphite. Somewhere beyond about 0.17 percent, sulfur may lead to the formation of blowholes in green sand castings. The majority of foundries maintain sulfur content below 0.15 percent with 0.09 to 0.12 percent being a common range for cupola melted irons. Collaud and Thieme report that, if the sulfur is decreased to a very low value together with low phosphorus and silicon, tougher irons will result and have been designated as “TG,” or tough graphite irons. The phosphorus content of most high-production gray iron castings is less than 0.15 percent with the current trend toward more steel in the furnace charge; phosphorus contents below 0.10 percent are common. Phosphorus generally occurs as an iron iron-phosphide eutectic, although in some of the higher- carbon irons, the ternary eutectic of iron iron-phosphide iron-carbide may form. This eutectic will be found in the eutectic cell boundaries, and beyond 0.20 percent phosphorus a decrease in machinability may be encountered. Phosphorus contents over 0.10 percent are undesirable in the lower-carbon equivalent irons used for engine heads and blocks and other applications requiring pressure tightness. For increased resistance to wear, phosphorus is often increased to 0.50 percent and above as in automotive piston rings. At this level, phosphorus also improves the fluidity of the iron and increases the stiffness of the final casting. Copper and nickel behave in a similar manner in cast iron. They strengthen the matrix and decrease the tendency to form hard edges on castings. Since they are mild graphitizers, they are often substituted for some of the silicon in gray iron. An austenitic gray iron may be obtained by raising the nickel content to about 15 percent together with about 6 percent copper, or to 20 percent without copper as shown in ASTM Specification for Austenitic Gray Iron Castings (A 436-63). Chromium is generally present in amounts below 0.10 percent as a residual element carried over from the charge materials. Chromium is often added to improve hardness and strength of gray iron, and for this purpose the chromium level is raised to 0.20 to 0.35 percent. Beyond this range, it is necessary to add a graphitizer to avoid the formation of carbides and hard edges. Chromium improves the elevated temperature properties of gray iron. One of the most widely used alloying elements for the purpose of increasing the strength is molybdenum. It is added in amounts of 0.20 to 0.75 percent, although the most common range is 0.35 to 0.55 percent. Best results are obtained when the phosphorus content is below 0.10 percent, since molybdenum forms a complex eutectic with phosphorus and thus reduces its alloying effect. Molybdenum is widely used for improving the elevated temperature properties of gray iron. Since the modulus of elasticity of molybdenum is quite high, molybdenum additions to gray iron increase its modulus of elasticity. Vanadium has an effect on gray iron similar to molybdenum, but the concentration must be limited to less than 0.15 percent if carbides are to be avoided. Even in such small amounts, vanadium has a beneficial effect on the elevated temperature properties of gray iron. The beneficial effect of relatively small additions of tin (less than 0.10 percent) on the stability of pearlite in gray iron has been reported by Davis et al. The results of extensive use of tin in automotive engines has been reported by Tache and Cage. Its use is particularly helpful in complex castings wherein some sections cool rather slowly through the Ar3 temperature interval. It has been found that additions of up to 0.05 percent antimony have a similar effect. In larger amounts, these elements tend to reduce the toughness and impact strength of gray iron, and good supervision over their use is necessary. Although most gray irons contain some titanium and the effect of titanium on the mechanical properties has been investigated many times, it is only recently that Sissener and Eriksson have reported the effect of titanium reduced from a titanium containing slag in an electric arc furnace. With titanium contents of 0.15 to 0.20 percent, the graphite flakes tend to occur as Type D graphite rather than predominantly Type A, which is generally considered desirable. They found that for irons with carbon equivalent of less than about 3.9 percent, the addition of titanium tends to lower tensile strength. but, for the higher carbon equivalent irons, tensile strength is improved. Increasing the titanium content of gray iron from about 0.05 to 0.14 percent through the use of a titanium bearing pig iron increased the strength of a hypereutectic iron in an ASTM Specification A 48 test bar A (7/8 in. diameter) from 22,000 to 34,000 psi. Further work is being done with titanium additions. Normally. nitrogen is not considered as an alloying element and generally occurs in gray iron as a result of having been in the charge materials. Morrogh has reported that at higher nitrogen levels the graphite flakes become shorter and the strength of the iron is improved. Gray irons usually contain between 20 and 92 ppm (0.002 to 0.008 percent) nitrogen. If the nitrogen approaches or exceeds 100 ppm, unsoundness may be experienced if the titanium content is insufficient to combine with the nitrogen. All cast metals are said to be section sensitive. As the section size increases. the solidification rate decreases with an accompanying increase in grain size and subsequent decrease in tensile strength. The effect of freezing rate on strength and hardness is more pronounced in gray iron than for other cast metals. This is a result of the mechanism of solidification. For a hypoeutectic iron, the first phase to separate on cooling is austenite in the form of dendrites at the liquidus temperature. As cooling progresses, the austenite dendrites grow, and the remaining liquid becomes enriched in carbon until the eutectic composition of 4.3 percent carbon equivalent is reached. This occurs at a temperature of approximately 2092° F depending on the silicon content. At this temperature, eutectic austenite and graphite in the form of flakes are deposited simultaneously. The austenite-graphite deposition occurs at a number of centers or nuclei, and these grow in size until all of the liquid is gone creating a cell-type structure. During this period of cell growth, the phosphorus is rejected toward the cell boundaries and freezes as a eutectic at about 1792°F. The presence of the phosphorus in the cell boundaries makes it possible to clearly reveal them by etching with Stead’s reagent. It has been demonstrated that the graphite flakes grow only within the boundaries of a cell and are interconnected. The cell size is dependent on the degree of nucleation of the iron and the freezing rate. It will vary from about 500 to as high as 25,000 cells per square inch. Since graphite has a much lower density than iron, the normal contraction which will occur when the iron changes from liquid to solid is completely compensated for by the formation of graphite. For ASTM Designation A 48, Class 30B iron, shrinkage is virtually absent so that sound castings are readily produced providing the mold has adequate rigidity. The graphite structure seen in gray iron has been completely established by the time the iron is solidified. Upon further cooling, some additional carbon is deposited on the graphite flakes until the Ar3 temperature is reached. As a result of the high silicon content of gray iron, the ransformation of austenite to pearlite and ferrite does not occur at a fixed temperature but takes place over a temperature range termed the “pearlite interval” and is explained fully by Boyles. Since the presence of silicon makes iron carbide unstable, the proportion of ferrite and pearlite in the matrix after transformation is completed will depend on the cooling rate through this temperature range. For heavy sections and high silicon contents, the matrix can be completely ferritic. The graphite flake type, form, and size can be defined by following the procedure described in ASTM Method for Evaluating the Microstructure of Graphite in Iron Castings (A 247-67). Since graphite is a relatively soft material, special care needs to be exercised in the preparation of a specimen for metallographic examination. If improperly done, the true shape of the graphite may be obscured by distorted metal that flowed over the graphite. It is only after several etching and polishing operations that a true representation of the graphite will be revealed. Several molding processes are used to produce gray iron castings. Some of these have a marked influence on the structure and properties of the resulting casting. The selection of a particular process depends on a number of factors, and the design of the casting has much to do with it. The processes using sand as the mold media have a somewhat similar effect on the rate of solidification of the casting, while the permanent mold process has a very marked effect on structure and properties. Green sand molding is frequently the most economical method of producing castings. Until the introduction of high-pressure molding and very rigid flask equipment, dimensional accuracy has not been as good as can be obtained from shell molding. If green sand molds are not sufficiently hard or strong, some mold wall movement may take place during solidification, and shrinkage defects develop. Although castings up to 1000 lb or more can be made in green sand, it generally is used for medium to small size castings. For the larger castings, the mold surfaces are sometimes sprayed with a blacking mix and skin dried to produce a cleaner surface on the casting. This procedure is often used on engine blocks. To withstand the higher ferrostatic pressures developed in pouring larger castings; dry sand molds are often used. In some cases, the same sand as used for green sand molding is employed, although it is common practice to add another binder to increase the dry strength. The shell molding process is also used for making cores which are used in other types of molds besides shell molds. Its principal advantage is derived from the ability to harden the mold or core in contact with a heated metal pattern, thus improving the accuracy with which a core or mold can be made. In addition to the improved accuracy, a much cleaner casting is produced than by any other high-production process. Although the techniques and binders for hot box and the newest cold box processes differ from those used for the shell molding process, the principle is similar in that the core is hardened while in contact with the pattern. Centrifugal casting of iron in water-cooled metal molds is widely used by the cast iron pipe industry as well as for some other applications. With sand or other refractory lining of the metal molds, the process is used for making large cylinder liners. For some types of castings, the permanent mold process is a very satisfactory one, and its capabilities have been described by Frye. Since the cooling or freezing rate of iron cast into permanent molds is quite high, the thinner sections of the casting will have cementite. To remove the cementite the castings must be annealed, and it is universal practice to anneal all castings. The most economical composition of the iron for permanent mold castings is hypereutectic. This type of iron expands on solidification, and, because the molds are very rigid, the pressure developed by separation of the graphite during freezing of the eutectic ensures a pressure tight casting. Since the graphite occurs predominantly as Type D with very small flakes, permanent mold castings are capable of taking a very fine finish. For this reason, it finds extensive use in making valve plates for refrigeration compressors. The process is also ideally suited for such components as automotive brake cylinders and hydraulic valve bodies. Although the predominantly Type D graphite structure in permanent mold castings with a matrix of ferrite have much higher strength than sand castings of comparable graphite content, the structure is not considered ideal for applications with borderline lubrication. The castings perform very well, however, when operating in an oil bath. Unless some special properties are desired and are obtained only with a particular casting process, the one generally selected yields castings at the lowest cost for the finished part. There are a number of requirements which must be met before the design of a casting can be considered completely satisfactory. In some respects, the design of a casting for gray iron is somewhat simpler than for any other foundry metal in that solidification shrinkage is at a minimum and for the softer grades is absent altogether. With few exceptions, little concern needs to be given to the problem of feeding metal to heavier sections. Patternmakers shrinkage is also low. The low shrinkage characteristics contribute to freedom from hot tears encountered with some of the other foundry metals. These factors afford the engineer greater freedom of design. Although a casting must be designed to withstand the loads imposed on it, there are many instances where deflection under load is of primary consideration to ensure proper alignment of components under load. There are a number of handbooks which contain information helpful to the design engineer[17-19]. The appearance of many castings suggests, however, that the designer has been unduly influenced by the characteristics of flat plates and other wrought shapes. It appears he is unable or incapable of utilizing tapered sections, long radius fillets, and variable thickness sections which are easily obtained in a casting. Instead of a clean design, the casting is a conglomeration of plates, ribs, bosses, and small radii. Because of the low level of elongation values for gray iron, the only satisfactory method of determining stress levels in a casting under load is through the use of SR-4 strain gages. Without proper stress analysis, the first tendency is to “beef” up the section in which failure has occurred. Grotto has shown that such an approach does not result in the best design and often makes the condition worse. The molding method must be decided upon before a final casting design can be achieved. If the casting has internal cores, they must have some means of support and these must be provided for in the design. In using molding methods capable of greater control over dimensional accuracy, it is often possible to reduce section thickness. As the section thickness is decreased and the cooling rate accordingly accelerated, the strength per unit of cross-sectional area increases. In general, a 50 percent reduction in casting section results in somewhat less than a 40 percent reduction in section strength. If the castings have complex core assemblies, such as are found in diesel engine cylinder heads, provision must be made to get the sand out of the cored passages and to allow inspection. With an increasing trend toward higher machining speeds and metal removal rates, thought must be given to the manner in which the casting is held during the machining operation so that high chucking pressures do not distort the part. Furthermore, the design should include readily maintained locating points. An ingate should not be placed at a locating point because, in grinding the connection in the finishing operation, some variation in the amount of metal removed can be expected. The mechanical properties of gray iron are dependent on cooling rate. Some care needs to be exercised in avoiding extreme ranges in section thickness, or hard edges will be found at the extremities of the thin sections and too low hardness in the heavy sections. It may be desirable to increase the thickness of the lightest sections to avoid this condition. Sometimes a bead along the outer edges of a flange may be helpful. lf the casting is to be used in an application where vibration is a problem, consideration needs to be given to the damping capacity of the casting. Although gray iron has quite a high damping capacity, casting design to avoid resonance should also be considered. Small appendages on castings should be avoided or strengthened to avoid undue breakage in the handling, finishing, and shot blasting operations. Although the subject of casting design has received much attention during the past 10 years, a great deal more needs to be done in the field of gray iron casting design. Properties of principal interest to the designer and user of castings are: resistance to wear; hardness; strength; and, in many cases, modulus of elasticity. Some of the relationships between these properties are quite different for gray iron as compared with steel. 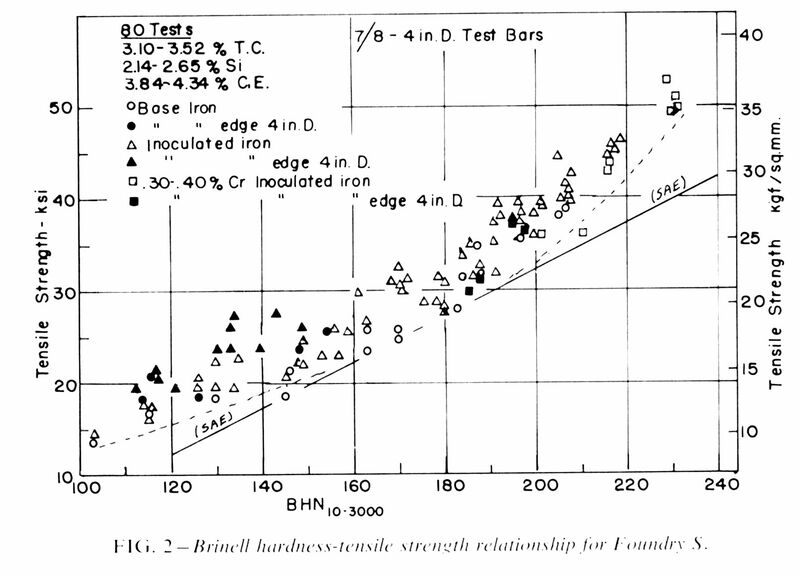 The variable relation between hardness and tensile strength in gray iron appears to confuse the engineer when most of his experience may have been with other metals. The excellent performance of gray iron in applications involving sliding surfaces, such as machine tool ways, cylinder bores, and piston rings, is well known. The performance in internal combustion engines and machine tools is remarkable when one considers the ease of machining gray iron. Gray iron is also known for its resistance to galling and seizing. Many explanations have been given for this behavior, such as the lubricating effect of the graphite flakes and retention of oil in the graphite areas. This is very likely true, but it is also possible that the graphite flakes allow some minor accommodation of the pearlite matrix at areas of contact between mating surfaces. It is seldom possible to obtain perfect fits, and, ordinarily, high spots in mating metal surfaces may result in high unit pressures causing seizing. The Brinell hardness test is the one most frequently used for gray iron, and, whenever possible, the 10-mm ball and 3000-kg load is preferred. If the section thickness or area to be tested will not withstand the 3000-kg load, a 1500-kg load is frequently used. The hardness values obtained with the lower load may differ appreciably from those obtained with the higher load, and this possibility is pointed out in ASTM Test for Brinell Hardness of Metallic Materials (E 10-66). For gray iron, the difference in hardness values may be as great as 35 BHN, and, if a difference exists, it is always lower for the lower load. Since in most cases the Brinell hardness test can be considered a nondestructive test, Brinell hardness is used as an indication of machinability, resistance to wear, and tensile strength. For light sections, such as piston rings and other light castings having a small graphite size, the Rockwell hardness test is often satisfactory. The Brinell hardness test is actually a specialized compression test and measures the combined effect of matrix hardness, graphite configuration, and volume of graphite. The Brinell hardness of gray iron with an entirely pearlitic matrix may vary from as low as 148 to over 277 depending on the fineness of the pearlite and to a greater extent on the volume of graphite present. Over this range of hardness, the actual hardness of the pearlite may vary from about 241 to over 400 Knoop hardness as determined by microhardness measurements. Virtually, all specifications and standards for gray iron classify it by tensile strength. The tensile strength of gray iron for a given cooling rate or section size is very much dependent on the amount of graphite in the iron. The carbon equivalent value for the iron will give a close approximation to the amount of graphite present. The tensile strength is also very much influenced by cooling rate, particularly through the eutectic solidification interval, and is generally related to section size. In recognition of the effect of section size on strength, ASTM Specification A 48 not only classifies the iron by strength but also requires selection of the size of the test bar in which the strength is to be obtained. The majority of purchasers of gray iron castings rely on the Brinell hardness test to determine if the casting meets specifications. 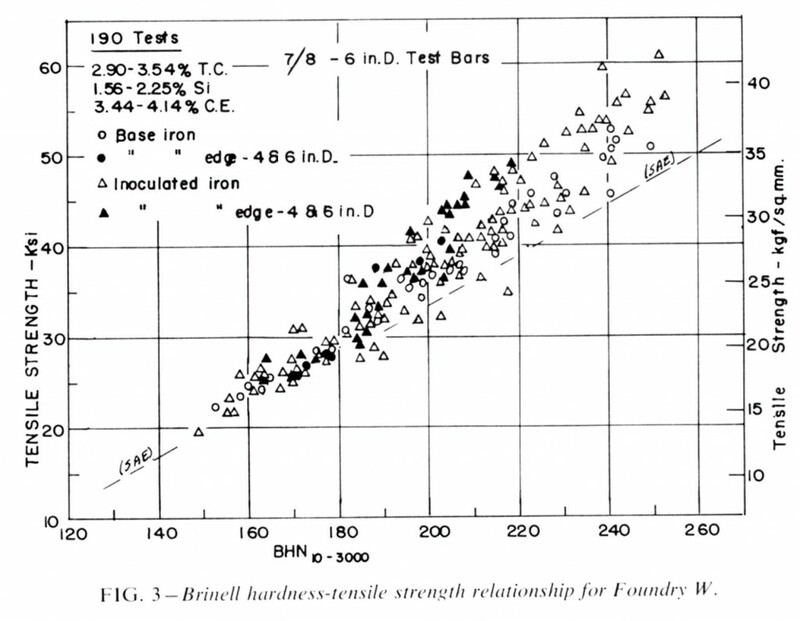 The variable relation between Brinell hardness and tensile strength for gray iron is confusing to materials engineers, who are accustomed to the fixed relation of Brinell hardness to tensile strength for wrought steel of about 492. For gray iron, the ratio will vary from as low as 140 for low-strength irons to over 250 for gray irons having a tensile strength of over 60,000 psi. In recognition of the wide use of the Brinell hardness test for estimating the strength of the iron in the casting, Division 9 of the Iron and Steel Technical Committee (ISTC) of the Society of Automotive Engineers is in the process of revising SAE J431 a. Gray iron for automotive castings, in which gray iron castings meet various strength levels, will be specified by a minimum Brinell hardness. There have been numerous papers dealing with the subject of the correlation of Brinell hardness with tensile strength. Probably the most extensive report was that prepared by MacKenzie from data obtained for the “Impact Report” for ASTM Committee A-3 (now A-4). The report by him was widely published and showed considerable scatter. He felt that some of the scatter could have been a result of the manner in which the Brinell hardness measurements were made. When he selected data taken from the shoulders of the tension test specimens, the correlation was very much better. Many users and particularly engineers are critical of cast metal properties obtained from test bars. The situation for gray iron is very much different from that of the other cast metals. Whereas the other ferrous metals, particularly steel and nodular iron, use test bars with an unusually high ratio of riser to test bar quite unlike the relation used for a commercial casting, test bars for gray iron are quite simple castings and gated very much like commercial castings. This can be done since there is either very little shrinkage or none in gray iron. Careful investigations have shown that if the test bar has the same thermal history as the section in the casting under consideration, hardness and tensile strength will be similar. In a casting with varying section sizes, the properties in the casting will only be the same where solidification and cooling rates are the same. It is possible to predict the tensile strength in other parts of the casting if the Brinell hardness is determined. Although the castings were made under normal production conditions, all phases of the operations were observed more thoroughly than usual. All testing was done in a research laboratory with properly calibrated equipment and with qualified operators. Dimensions of tension test specimens conformed to ASTM Specification A 48. The tension test specimens were machined from the center of the casting for all sizes and, in addition, were machined from a position about 3/4 in. from the outside for the 4 and 6-in castings. The tension test specimens had a reduced section diameter of 0.75 in., with the exception of the test specimen from the 7/8-in. casting which had a diameter of 0.5 in. in the reduced section. Brinell hardness tests were made with a 3000-kg load and 10-mm ball. The hardness measurements were taken on a cross section of the casting corresponding with the position from which the tension test specimen was taken. Foundry F normally produces light to medium weight castings, such as small compressor heads and bodies, air conditioning component castings, valve and pressure regular bodies, manifolds, and other types of auto- motive castings. Since section sizes seldom exceed 1 in., the testing is confined to 7/8 and 1.2-in. bars. Some of the irons are alloyed with one or more of the elements (copper, chromium, and molybdenum) in small to moderate amounts. The data are shown in Fig. 1. The proposed minimum Brinell hardness being considered by the SAE Division 9 ISTC Committee is also shown. With only two exceptions, the values are all above the line. Foundry S is a jobbing foundry specializing in truck and marine diesel and gasoline engine blocks and heads together with related items, such as flywheels, manifolds, transmission cases, and clutch housings. Since heavier sections than in Foundry F are being made, test bar castings up to 4 in. diameter are cast. The data obtained are shown in Fig. 2. The alloyed irons are at a higher strength level. Note that test specimens cut from near the outer surface of the 4-in.-diameter bars show a higher strength for a given hardness than test specimens machined from the center of the 4-in. bars. This is generally a result of a larger graphite flake size in the center of the bar. Also, note that all of the values are above the SAE line. Foundry W produces medium to heavy castings for large gas line compressors, engines, pumps, flywheels, and related items with sections up to 4 in. The complete range of test bar sizes are cast at this foundry. The data obtained are shown in Fig. 3. The scatter in values becomes somewhat larger at the higher strength levels. Note that the inoculated irons are higher in strength than the base iron bars, which accounts for the increase in range of tensile strengths for a given hardness. Some of the tensile strength values falling below the SAE line are from the center of the 6-in.-diameter sections and have a rather large graphite flake size. Some casting users specify a minimum tensile strength at some designated location in the casting. This is particularly true for such castings as hydraulic pump bodies, high-duty diesel engine cylinders, pistons and heads, and other highly stressed castings. Data obtained from production castings are shown in Fig. 4. Also shown on this figure for comparison are data obtained from tension test specimens cut from annealed permanent mold castings. These castings will be hypereutectic in composition with Type D graphite and a ferritic matrix. These irons have a higher strength for a given hardness than irons cast in sand. 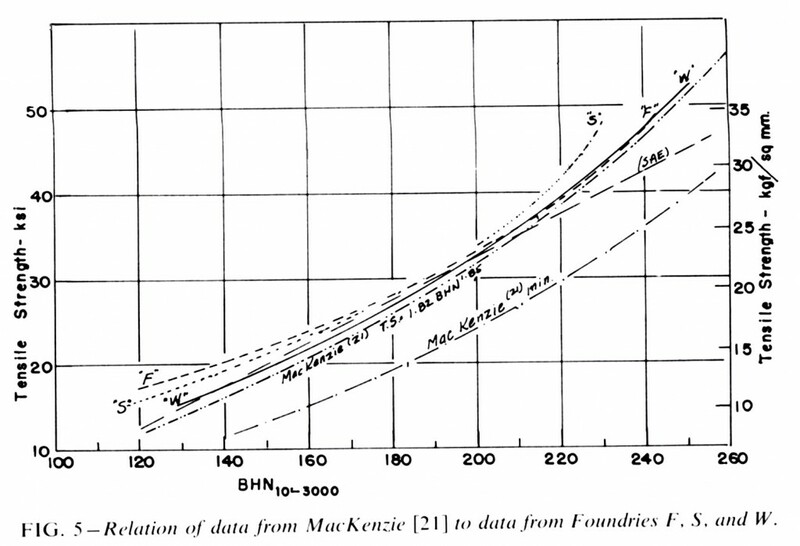 Curves showing the minimum Brinell hardness for a given tensile strength for the irons reported, together with MacKenzie’s and Caine’s data, are shown in Fig. 5. The curves are in fair agreement except for the minimum values reported by MacKenzie. It is possible that the irons for Foundries F, S, and W had a higher concentration of residual alloying elements, which would tend to keep the matrix pearlitic with accordingly higher strength. It is sometimes necessary to machine tension test specimens with a reduced section of 0.357 in. diameter from a casting, since the casting shape does not allow making a larger size specimen. Some casting users have raised the question of the reliability of the smaller specimens. Over a period of years, several size specimens have been taken from the same casting, and it has been found that, if machining is carefully done, the results are reliable. The data in Fig. 6 are representative and have been obtained from a small automotive clutch plate. The hardness and tensile strength data for this casting show that a 5/8-in. plate has a similar cooling rate to a 1.2-in. test bar. In trying to predict tensile strength in a casting from Brinell hardness, there are more factors involved than mere section thickness. For sections from which heat flow during cooling is unimpeded, a very good hardness-tensile strength relationship can be established. For more complex castings, such as diesel engine cylinder heads having many cored passages, the cooling pattern may be complicated. The section within the head may freeze fairly rapidly, but, after the eutectic temperature interval is passed, there is a heat build up, and the section may cool more like a simple section two to four times as thick. For such cases, a correlation needs to be worked out for each type of casting. Steel shows a rather minor influence of tensile strength and hardness on the modulus of elasticity, since it is mostly in the range of 29,000,000 to 30,000,000 psi. For gray iron, the modulus of elasticity not only varies with tensile strength but also with the stress level. As a result of these factors, the modulus of elasticity will vary from around 12,000,000 psi for a very soft iron to over 20,000,000 psi for a high strength iron. The stress-strain curve for gray iron in tension is almost a curved line from the origin. This has been reported by many investigators, and Morrogh, in reporting some work by Gilbert, suggests that the curve is a result of some volume changes in the spaces occupied by the graphite. They have also shown that some microcracking takes place between flakes. Some investigators have used resonant frequency measurements and also sound velocity measurements which are dependent on modulus of elasticity to predict tensile strength. In machine tool and other applications where maximum stiffness of a structure is desired, a high modulus of elasticity is desirable. There are other applications, notably those involving thermal fatigue for which a low modulus of elasticity is wanted to minimize the increase in stress levels associated with expansion resulting from temperature increases under operating conditions. High-duty brake drums are an example of this type of situation. It has been found that a rather high-carbon iron (3.60 to 3.92 percent) will give better service than a lower carbon iron. The higher-carbon irons nearly always have a lower modulus of elasticity. Unfortunately. the tensile strength tends to be low with such high-carbon irons. and it becomes necessary to add an alloy to strengthen the matrix. Materials engineers often look on percent elongation as obtained from tension test specimens as a measure of the ductility of the material. With this concept. gray iron would not be considered ductile. Nevertheless. gray iron in the form of commercial castings will satisfactorily withstand a considerable amount of moderate shock loading. With careful control of melting practice and selection of raw materials, Collaud and Thieme have reported irons with 2.4 percent elongation at fracture under load and by ferritizing such an iron have obtained 5.4 percent elongation. Gray irons of the same tensile strength may show differences of 50 percent in regard to breaking energy absorbed in shock loading. Although gray iron is said not to be notch sensitive, this is most likely a result of being fairly well saturated with notches in the form of graphite flakes so that the presence of another notch does not materially affect the behavior on impact. Although the majority of gray iron castings are used in the as-cast condition, gray iron is heat treated for a variety of reasons, such as to relieve residual stresses, improve machinability, increase the hardness of the surface either through induction or flame hardening, or harden the entire section through an oil quench and draw treatment. Recommended practice for such heat treatments and the results obtained will be found in handbooks dealing with cast iron, particularly, ASM Metals Handbook. The graphite structure cannot be changed by heat treatment. although the graphite may increase in volume if a pearlitic iron is completely ferritized, in which case, the graphite is usually deposited on the flakes originally present. The matrix however is quite responsive to heat treatment just as in the case of steel. Stress relief heat treatments are generally made in the temperature range of 1000 to 1100°F. Below 950°F the relief of stresses proceeds rather slowly, while at temperatures above 1100°F, some loss of strength may be experienced particularly in unalloyed, ASTM Designation A 48. Class 35B irons and softer. Stress relief heat treatments may be given to improve the dimensional stability of machined castings and are required for pressure containing parts operating at over 450°F and up to 650°F made to ASTM Specifications for Gray Iron Castings for Pressure-Containing Parts for Temperatures up to 650°F (A 278-64). Heating and cooling rates for such a heat treatment are generally limited to 400 F/h per inch of thickness. This is particularly important on heating as the residual stresses in the casting may be increased as a result of thermal expansion of various parts of the casting. Smaller castings such as refrigeration compressor parts are often stress relief annealed to maintain very close operating clearances in the finished compressor. If difficulties are being encountered with residual stresses in the finished machined parts, it is desirable to evaluate the internal stress level after each machining operation. Castings sometimes have a lower level of internal stresses as they come from a shell molding operation than at any other time in the process. Such castings given stress relief annealing treatments and then subsequently run through a shot or grit blasting operation will show an increase in stress level. In stress relief annealing of large castings, it is desirable to affix thermocouples onto the casting to see that temperature differences do not become too great. A casting can be broken in heating unless precautions are taken. A cast iron table 4 ft wide and 6 ft long cracked during the stress relief heat treatment. Although the furnace control thermocouple showed a uniform heating rate within recommended limits, thermocouples at various locations on the casting showed temperature differences of 300°F. Another table of the same design was arranged outside the furnace with thermocouples and strain gages so that the temperature difference could be reproduced. It was found that for this temperature difference tensile stresses of 9200 psi in critical areas were reached. Annealing for improved machinability is carried out in two temperature ranges. If the principal purpose is merely to reduce hardness to some lower level and no carbides are present, temperatures of 1250 to 1450°F are generally employed depending on how much reduction in hardness is desired. If the castings have cementite or carbides, it is necessary to heat to a 1650 to 1725°F range to break down such carbides. Gray iron can successfully be hardened by either flame or induction heating. The matrix of the iron should be pearlitic. It is also desirable to keep silicon at the lowest feasible level, generally below l.75 percent. As the silicon content of gray iron is raised, not only is the Ac3 temperature increased, but a two-phase field of ferrite and austenite is encountered. Satisfactory hardness will not be obtained when the iron is heated in this temperature range. The higher austenitizing temperatures required for the higher-silicon irons also increase the possibility of cracking during the quenching cycle. It is customary to specify the desired hardness in terms of Rockwell hardness, C scale, although the hardness measurements were made with a scleroscope. Direct measurement with a Rockwell hardness test using the C scale is not satisfactory as the presence of the graphite flakes in the hard matrix results in spalling or crushing around the indenter giving low values. For parts such as cylinder liners, through hardening by austenitizing and oil quenching followed by a draw to yield the desired hardness greatly improves the performance of the liner. There are many applications for which this type of heat treatment is more suitable than flame or induction hardening. Of the widely used ferrous materials for construction purposes, gray iron for a given hardness level is one of the most readily machinable. Gray iron is free cutting in that the chips are small and easily removed from the cutting area. Furthermore, there is little difficulty with the chips marring the finished surface. The free cutting behavior is a result of the randomly distributed graphite flakes which interrupt the continuity of the matrix. Although gray iron is very successfully machined without coolants, they may be found necessary if high machining rates and close tolerances are desired. The coolant not only helps in chip removal but also controls the temperature of the casting, which is necessary for close tolerance work. In spite of the good machinability of gray iron, various machining problems are encountered such as hard edges, reduced tool life, inability to obtain a satisfactorily smooth surface, and difficulty with maintaining the desired dimensional tolerances. Some of these problems are a result of selection of the wrong grade of iron, shortcomings in design of the casting, or incorrect machining procedures. Recommended tooling, speeds, feeds, and depths of cut for gray iron of various strength classifications and for various types of machining operations are readily found in a number of handbooks [3, 5, 23, 24] and will not be discussed here. Since many castings are purchased to meet ASTM Specification A 48, hardness will vary for a given strength class specified. Castings consistently near the top hardness limit may require a reduction in surface cutting speed to obtain satisfactory tool life as compared with castings near the lower hardness limit. Iron of normal composition for the type of casting produced may solidify with a mottled or chilled iron structure if a critical cooling rate is exceeded. Such a condition may result from a fin on the casting, or, if the casting has a wide range in section sizes, the foundry may resort to unusually heavy alloy additions to keep the hardness up in the heavy section, which will result in the iron being too hard for the lighter sections. Encountering such hard areas very often results in breakage of the tool or sufficient damage to the cutting edge to interfere with subsequent satisfactory machining operations. Sometimes the design of the casting can be modified to avoid the formation of chilled edges, or foundry practice can be modified by relocation of the gates or using flowoffs of various types to slow down the solidification rate of the problem area. Through proper use of inoculants, the foundry can appreciably reduce the incidence of hard edges. Walz  points out that the foundry during inspection can check for freedom from hard edges by means of a fairly simple file test and thus avoid damaging an expensive tool. With proper quality control and inspection procedures, the incidence of hard and chilled edges and bosses should be negligible. The sudden failure of a cutter was not always a result of encountering mottled or chilled iron. An investigation of failure of a large, inserted tooth face milling cutter disclosed that a heavy, decarburized, layer of ferrite was responsible for the failure. The castings had been annealed to a low hardness level of 121 BHN maximum, and in so doing a thick ferrite layer devoid of graphite was produced. This material was very tough rather than hard, but it stalled the cutter with resulting chipping of carbide teeth. Since such a decarburized surface is free of graphite flakes, a shiny and bright finish will give the impression that it is hard. Inadequate cleaning of the casting or the presence of burned in sand can cause premature failure of the tool. Zlatin  reported that if such a condition is encountered, it may be necessary to reduce machining rates to half of those used for subsequent cuts if satisfactory tool life is to be obtained. A machined surface defect sometimes encountered in cylinder bores, ways and slides of machine tools, and other surfaces requiring a low rms finish is referred to as a pitted or open grain surface. An iron of too high a carbon content for the section involved and which generally has long graphite flakes may result in particles of the iron being torn out during rough machining, thus leaving insufficient stock for finish machining. Lamb  states that a minimum of 0.010 in. should be left for a finish cut if a smooth surface is wanted. If graphite flakes are too large, difficulty with ragged threads will be experienced in cutting threads and “breakout” at the edges of castings, such as the bores in hydraulic spool-type valve bodies, may occur. Although too high a carbon content can produce this type of surface defect, dull tools and too heavy cuts prior to the finish cut or honing operation will produce a similar defect. Field and Kahles discuss factors which affect the quality of the machined surface and emphasize the importance of sharp cutting tools. As a result of the demand for ever closer tolerances for the machined casting, problems with maintaining dimensions become more frequent. Some of these may result from residual stresses in the casting, some from variations in hardness and the amount of finished stock to be removed, and others from shortcomings in the machining operation. Whenever out-of round bores and difficulty with maintaining flatness of machined parts are encountered, residual stresses in the casting are suspected of being the cause. Depending upon the design, the determination of the direction and level of residual stresses in a casting may be complicated and usually requires destruction of the casting. For simple, cylindrical parts, the presence of residual stresses can sometimes be detected by merely making saw cuts in the casting and measuring the change in width of the cut. For more complex castings or for more exact measurement of residual stresses, it is necessary to resort to the use of SR-4 strain gages. Some trial and error approach to the proper location of the gages on a casting is generally required. Although a residual stress evaluation of a casting after final machining may show such stresses to be responsible for the distortion, it does not necessarily follow that these stresses were in the original casting. Severe stresses can be introduced by various machining operations. The use of a too hard wheel on a surface grinding operation can introduce surface stresses. ln addition to internal stresses, either residual or introduced during the machining operation, difficulty with maintaining critical dimensions can arise from other sources. If the casting is subjected to clamping pressures which distort the casting in the holding fixture while being machined, difficulties with holding dimensions can be expected. Since the modulus of elasticity of a 30,000 psi tensile strength gray iron is approximately half of that of steel, the same clamping pressure on a part of the same wall thickness will double the distortion of the gray iron casting as compared with steel. If machining is done without a coolant, the casting will heat up while being machined. A bearing housing with a 2-1/2 in.-diameter bore and a 3/8 in. wall will expand about 0.0005 in. with a temperature increase of 25° F, it was found that a variation of 1/32 in. in diameter of the bore of the casting with a normal 3/32-in. stock removal would result in a 25° F variation in temperature of the casting. If the tool setting is based on measurements of the casting as it comes off the lathe, final bore diameters at room temperature will vary over a range of 0.0005 in. Although there are differences in the rigidity of machine tools, some deflection always occurs. 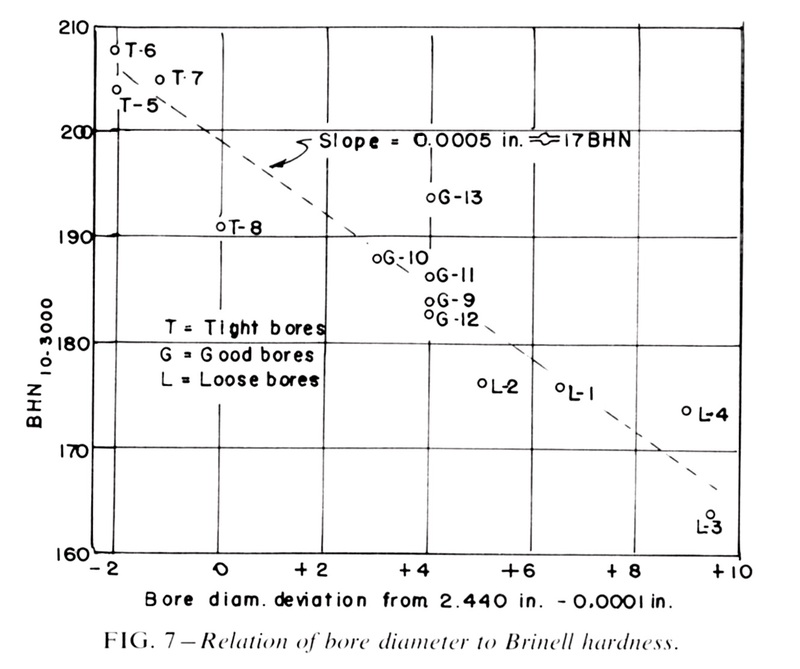 For the same bearing housing casting mentioned above, it was found that variations in Brinell hardness affected the finished bore diameter. The machine shop had previously classified finished bores into three size ranges. It was thought that this gaging operation could be eliminated by reducing machining tolerances to “0.00025 in. on a 2.5 to 3.0-in.-diameter bore. The castings were machined dry on a single spindle automatic lathe. Two cuts were taken, and the rough and finish tools were mounted in tandem on the same carrier. The operator was asked to set the machine to obtain the correct dimension and told not to change the setting regardless of bore diameter. Both the operator and inspector grouped castings by bore diameters being undersize, within range, and oversize. Specimens from the three groups were subjected to intensive examination and one of the factors appeared to be hardness as shown in Fig. 7. If relatively thin-walled castings are not centered properly in the machining fixture, more stock will be removed from one side than the other and a distorted bore may be expected. The properties of gray iron castings are almost as much dependent on foundry practice as they are on the metallurgy of the material. During the past 10 years, great progress has been made toward better dimensional control of castings, and there has been a trend toward thinner sections. This trend will continue, and the introduction of new inoculants with small amounts of such elements as cerium, calcium, barium, and strontium has proved effective in obtaining the desired properties in the lighter sections. De Sy described the behavior of oxygen in iron and its relation to inoculation practice. The development and extensive use of a procedure to indicate the carbon equivalent value of the molten iron at the melting furnace is described by Redshaw and Payne and by Kasch. This test enables the foundryman to control the composition of the iron within narrower limits and thus ensures more uniform properties of the castings. The addition of small amounts of tin was instrumental in improving the properties of gray iron in the heavier sections without creating hardness problems in the lighter sections. 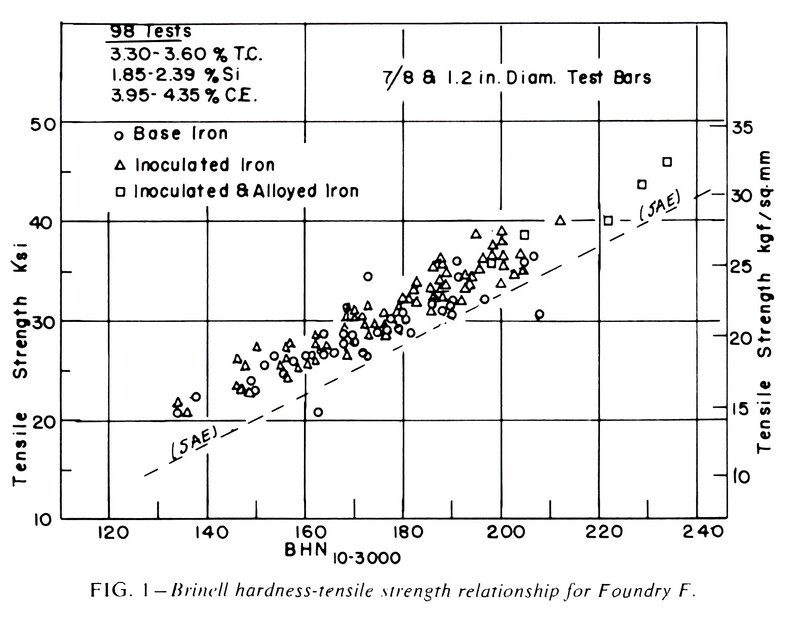 Although Brinell hardness is still a much used and useful test for evaluating the strength of gray iron, Walter  described a method involving resonant frequency measurements to predict engineering properties of gray iron. Abar et al described results obtained from a similar test. Carter reported the use of an eddy current tester as a rapid inspection tool to predict properties in gray iron castings. Barto et al described results with die casting iron of gray iron composition which should have specialized applications. Experimental work has shown that certain types of mold surface treatments will allow casting of much thinner sections than previously thought possible. The complex metallurgy of gray iron and the effect of rather small amounts of minor elements in iron on the solidification characteristics of gray iron has attracted the attention of a number of metallurgists. Morrogh has discussed the need for a better understanding of gray iron metallurgy. Bates and Wallace have shown the effect of small amounts of trace elements in gray iron and have investigated means of minimizing the undesirable effects of these elements. There is a need to develop mold materials or mold surface treatments to either eliminate or minimize the shot and grit blasting operation, which is costly and apt to introduce residual stresses in castings. The condition becomes worse as casting sections become thinner. The improved properties obtained with high-purity raw materials in making gray iron should stimulate further investigations particularly in regard to obtaining greater toughness. There is a need for a grade of iron between conventional gray iron and nodular iron providing it can be made with the same ease as gray iron. The large investments in gray iron foundries during the past few years is an indication that gray iron will be considered a valuable engineering material for some time to come. MacKenzie. J. T., “Gray Iron-Steel plus Graphite,” Foundry, Vol. 72, No. 8, Aug. 1944, pp. 86-88,154; No. 9, Sept. 1944, pp. 70-72; No. 10, Oct.1944, pp. 86-88. Boyles, Alfred, The Structure of Cast Iron, American Society for Metals, Metals Park. OH, 1947. Gray Iron Castings Handbook, Gray and Ductile Iron Founder’s Society, Cleveland, OH, 1958. ASM Metals Handbook, 8th ed., Vol. I . American Society for Metals, Metals Park, Ohio, 1961, pp. 349-365. Angus, H. T., Physical and Engineering Properties of Cast Iron, The British Cast Iron Research Assn., Birmingham, England. 1960. Cast Metals Handbook. American Foundrymen’s Society. Des Plaines, IL, 1957. Typical Microstructures of Cast Metals. 2nd ed.. The Institute of British Foundrymen, London, 1966. Wieser, P. F., Bates. C. E., and Wallace. J. F., “Mechanism of Graphite Formation in Iron-Silicon-Carbon Alloys” Malleable Founders Society, Cleveland, Ohio, I967. Rehder, J. E., “The Critical Temperature Range in Cast Irons”, Transactions, American Foundrymen’s Society, Vol. 73, 1965. pp. 473-487. Davis. J. A., Krause, D. E., Lownie, H. W., Jr., “Tin as an Alloy in Gray Cast Iron,” Transactions, American Foundrymen’s Society, Vol. 65, 1957, pp. 592-597. Tache. A. J. and Cage, R. M., “Tin-Alloying Speeds Production of Gray-Iron Cylinder Blocks.” Journal, Society of Automotive Engineers, Vol. 73. No. 1, Jan. 1965, pp. 66-69. Sissener, John and Eriksson, John, “The Influence of Titanium Reduced from Titanium Oxide Containing Slags on the Mechanical Properties of Cast Iron, Proceedings, 34th International Foundry Congress; Paper No. 1, Editions Techniques des Industries de la Fonderie, Paris,1967. Morrogh, H., “The Status of the Metallurgy of Cast Irons,” Journal of the Iron and Steel Institute, Jan. 1968, pp. 1-10. Boyles, Alfred. “The Pearlite Interval in Gray Cast Iron,” Transactions, American Foundrymen’s Society, Vol. 48, 1940, pp. 531-573. Frye, G. R., “Permanent Mold Process as Applied to Production of Gray Iron Castings,” Modern Castings, Vol. 54, No. 4, Oct. 1968, pp. 52-55. Caine, J. B., Design of Ferrous Castings. American Foundrymen’s Society, Des Plaines, Ill., 1963. A Practical Guide to the Design of Gray Iron Castings for Engineering Purposes, The Council of Ironfoundry Associations London,1960. Casting Design Handbook, American Society for Metals, Metals Park, Ohio, 1962. Grotto, L. A., “Engine Castings Development by Experimental Stress Analysis,” Transactions, American Foundrymen’s Society, Vol. 69,1961, pp. 636-645. MacKenzie, J. T., “Brinell Hardness of Gray Cast Iron-Its Relation to Other Properties,” Foundry, Vol. 74, No. 10, Oct. I946, pp. 88-93; pp. 191-194. ASM Metals Handbook, 8th ed., Vol. 2, American Society for Metals, Metals Park Ohio, 1964. pp. 203-213. ASM Metals Handbook, 8th ed., Vol. 3, American Society for Metals, Metals Park, Ohio. 1967. Machining Data Handbook, Metcut Research Associates, Inc., Cincinnati, Ohio, 1966. Walz, W., “Today’s Engineering Designs Create a Challenge to Foundry Cast Metals Industry,” Transactions, American Foundrymen’s Society, Vol. 72,1964, pp. 914-922. Zlatin, Norman, “The Machinability of an Unalloyed and an Alloyed Gray Iron,” Gray and Ductile Iron News, March 1965. pp. 5-14. Lamb, A. D., “Material and Technique Factors in the Machining of Iron Castings, Gray and Ductile Iron News, Part I, April 1967, pp. 5-13; Part II, May 1967, pp. 11-20. Field, M. and Kahles, J. F., “Factors Influencing Machined Finish of Gray Iron, Gray and Ductile Iron News, April 1966. pp. 5-23. De Sy, A., “Oxygen. Oxides. Superheating and Graphite Nucleation in Cast Iron,” Transactions, American Foundrymen’s Society. Vol. 75. 1967. pp. 161-172. Redshaw, A. A., Payne, C. A., and Hoskins. J. A., “Gray Cast Iron Control by Cooling Curve Techniques, Transactions. American Foundrymen’s Society, Vol. 70. 1962, pp. 89-96. Kasch, F. E., “Carbon Equivalent by Cooling Curves-A Rapid and Practical Test,” Transactions, American Foundrymen’s Society, Vol. 71 , 1963. pp. 266-274. Walter, G. H., “Correlation of Structure Characteristics and Resonant Frequency Measurements with the Engineering Properties of Gray Iron,” Publication 650519, Society of Automotive Engineers, 1965. Abar, J. W., Cellitti, R. A., and Spengler, A. F., “The Use of Sonics to Predict the Mechanical Properties of Gray Iron, Transactions, American Foundrymen’s Society, Vol. 74, 1966, pp. 7-I2. Carter, K. D., “Non-Destructive Eddy Current Testing of Gray Iron, Gray and Ductile Iron News, Feb. 1966. pp. 8-10. Barto, R. L., Hurd, D. T., and Stoltenberg, J. P., “The Pressure Die Casting of Iron and Steels.” Transactions. American Foundrymen’s Society, Vol. 75, 1967, pp. 181 – 192. Morrogh, H., “Progress and Problems in the Understanding of Cast Irons,” Transactions, American Foundrymen’s Society, Vol. 70, 1962. pp. 449-458. Bates, C. E. and Wallace. J. F.. “Effects and Neutralization of Trace Elements in Gray, Ductile and Malleable Iron,” Transactions, American Foundrymen’s Society, Vol. 75. 1967, pp. 815-846.